President Abbas has brokered a peace deal amongst Christian sects with rights to occupy the Church of the Nativity in Bethlehem. The truce will allow much needed repairs to take place at the 1500 year Christian shrine. See http://www.guardian.co.uk/commentisfree/belief/2010/oct/26/bethlehem-church-nativity Tense relations between and among the Catholic, Orthodox and Armenian guardians of the Church have hampered much needed repairs for years. The divisions of responsibility for the shrine date back at least to Ottoman times. The composition of the find (U.S. Gold coins) and its late date (the last coin was minted in 1913) makes it quite unusual. It does again also demonstrate that coins "travel." Not surprisingly, Prof. La Follette has emphasized different things. More disappointingly, La Follette has also glossed over some items that are significant. For example, nothing is said about the 70% of the public comments opposed to the MOU or its extension to coins or the fact that Greece allows its own coin collectors to import any unprovenanced ancient coins they want. I've posted a link to my own summary on the AIA blog, but it has yet to appear. Should Law Enforcement Accept Awards at a Fundraiser for an Archaeological Advocacy Group? http://www.savingantiquities.org/event.php?eventID=235 DHS, FBI and DOJ employees can attend at a discounted rate only available to SAFE members. SAFE's "Beacon Awards" honorees have or had enforcement authority relating to the import of cultural antiquities. Some might find this troubling. SAFE has in the past taken what many consider to be an extreme view as to what is "stolen" or illegally imported under U.S. law. SAFE also regularly conflates its version of morality and legality in its advocacy. Law enforcement should never do so when it enforces the law. In addition, government officials should avoid any appearance of bias or conflict of interest. Would it be appropriate for a meat inspector to accept an award from PETA or an EPA official to accept an award from Greenpeace? If so, the link remains tenuous. The search term "antiquities" comes up with only 16 hits in a universe of 391,000 documents. See http://wikileaks.org/iraq/diarydig. And many of these have nothing at all to do with antiquities smuggling. There has yet to be a full investigation of this relationship between Saddam's regime and Western archaeologists. However, one wonders how much it colored reports of looting at the time. Ironically, documents from the Baath Party archieve that are being repatriated to Iraq might have shed light on this issue, but it remains to be seen if those documents will actually be preserved and studied. See http://culturalpropertyobserver.blogspot.com/2010/05/jewish-archive-to-return-to-iraq-along.html Perhaps someone needs to release their contents to Wikileaks too. It is heartening to see that the Ministry of Culture, presided over by Prime Minister Manmohan Singh and administered by Secretary Jawahar Sircar, is actively considering amending the 1972 Act on Antiquities. Few laws have borne such bitter fruit as the Indian Antiquities and Art Treasures Act of 1972, ushering in a Dark Age for the heritage it sought to protect. What prompted the then Government to enact this legislation was to prevent smuggling and help develop public interest in our heritage. The time has come honestly to appraise its effects. The Act has destroyed legitimate domestic trade in antiquities, thereby making smuggling an attractive option. Its onerous provisions for registration (requires registering of objects more than 100 years old, 75 years in the case of textiles, with details of the purchaser, seller, price, origin of the piece along with photo documentation) and licensing have made antiquities a no-go area, to the extent that even scholarship and research into our heritage has gone into sharp decline. The chickens are now coming home to roost. The Government cannot find scholars of repute to head its museums and their specialised departments. More than 50 per cent of all our public museums (including the National Museum), home to the bulk of the nation’s artistic patrimony, are headless. Art and art scholarship depend on patronage and a lively market place. It requires a network of collectors, dealers and scholars to authenticate individual pieces, guide collectors and educate the public. The Act destroyed this network, the complexities of registration and possibility of prosecution deterring collectors. No collection of any significance has been formed since 1972, in sharp contrast to the numerous collections between 1947 and 1972. The licensing of dealers and the requirement of a detailed inventory for each object drove the trade underground. I am told there are only two dealers who ever took a licence. The study of antiquities also withered. The story of the two auction houses which attempted to revive domestic trade in Indian antiques is well-known. Sotheby’s in 1992 and Bowring’s in 2004 were auctioning registered pieces. The CBI and Archaeological Survey of India hounded them, forcing them to close shop. Bowring’s case is still under adjudication after it won in the High Court but the ASI chose to file an appeal in the Supreme Court. The Antiquities Act was flawed in its scope and ambition. No distinction is made between humble art objects and works of art of high value. In the event, only a small proportion of the total was actually registered. The registration papers are scattered all over the country, often misplaced, requiring owners to re-register their collections. The Indian contemporary art scene is fuelled by the new rich. Galleries, curators and auctions have mushroomed while prices have been benchmarked. The trading value of contemporary art runs into thousands of crores. There is, however, no means of evaluating the price of an Indian antique. China, which destroyed its own priceless heritage during Mao’s Cultural Revolution, has realised the importance of its inheritance. We, who are envious of its economic track record, should be equally so of what it is doing to protect its heritage. Its museums are now world-class. Though it has a ban on antique exports, China has opened up its domestic market. Chinese antiques are being sold to China’s new rich at prices higher than in Western salerooms. Foreigners owning valuable Chinese artworks are increasingly selling these through Chinese auction houses. India’s new rich, like their Chinese counterparts, have the appetite and resources to buy heritage art. My estimate is that benchmark valuations will grow exponentially once the competitive urge to acquire takes hold of rich Indians. The Indian Antiquities and Art Treasures Act was passed during the heyday of the licence raj, an era brought to its end by none other than Dr. Manmohan Singh. It would be in the fitness of things if he could now free antiquities from the clutches of the bureaucracy with similar beneficial effects. Antiquities must once again become objects to cherish, not shun. Despite an indication that the State Department was considering an expansion of import restrictions into other areas (possibly religious art), that does not appear to have happened. We'll have to wait for the renewed MOU to be posted to see if any of the AAMD's other suggestions made it into the document. It does not appear to have tightened any requirements of Art. II, and, if anything, seems to have loosened them a bit. The AAMD and others have noticed the following pattern emerge. Source countries make promises to secure a MOU. They don't get around to implementing them. Five years later, the MOU is renewed anyway. Five years more pass. They still haven't implemented their promises, but rather than scaling back the MOU or dropping it all together, State agrees to loosen the requirements of Art. II. At last week's CPAC meeting on the Greek MOU, I was struck by Greece's oversized delegation. If memory serves, there may have been as many as 11 officials present. I can only assume at least some flew in from Athens for the occassion. In contrast, most countries find a way to make do with far fewer officials. For example, Italy sent 3 officials to the recent CPAC meetings on the renewal of its MOU, one from the Culture Ministry and two from the Embassy. Smaller countries often typically manage just fine with one Embassy official. What gives? Doesn't such excess just confirm the worst about the bloated Greek cultural establishment? While no one said it openly last week (but they did in written submissions), it is common knowledge Greece's cultural establishment was a mess even before Greece's economic meltdown. See http://culturalpropertyobserver.blogspot.com/2010/02/greek-economic-woes-hit-cultural.html. Here is the ultimate question: Should the US help prop up the status quo in Greece, particularly when over 70% of the public comments to the proposed MOU are opposed? I think not. Greece needs to drastically reform its own cultural bureaucracy first, and get away from the over regulation that just ensures there is one rule for insiders and another for the common Joe. As was suggested during the hearing, at a minimum the Greek cultural bureaucracy should at least be held to actually following Greek law, which includes at least some protections for collectors and finders. On October 12, 2010, the United States Cultural Advisory Committee (“CPAC”) conducted a public hearing to discuss a proposed Memorandum of Understanding (“MOU”) with the Hellenic Republic. Despite the importance of the hearing, only six (6) CPAC members attended: Reid (Chair, museum representative); Holladay (public representative); O’Brien (public representative); Korver (trade representative); Connelly (archaeological representative); and Wilkie (archaeological representative). There was a large Greek delegation present, led by the Deputy Chief of Mission, Ioannis Vrailas. A representative of the Alpha Bank (which maintains a large coin collection) was also present. Ten speakers spoke in favor of the proposed MOU. Eight speakers expressed reservations about the MOU or the extension of import restrictions to coins. A representative of the Greek cultural establishment then spoke. In possible contradiction to Mr. Vralis, she indicated that Greece seeks restrictions on all unprovenanced artifacts. She justified this request on the basis that context once lost is lost to all future generations. Proponents of the MOU then spoke. James Wright of the American School of Classical Studies at Athens indicated that there is current looting in Greece, particularly in remote areas. Wright passed around some pictures of looted tombs and then discussed grave robbing by well known locals. He indicated that tomb robbers typically destroy less valuable artifacts along with the context. In response to a question by CPAC member Joan Connelly (archaeology), Wright indicated that coins are subject to looting and that 3 Frankish coins that were found had an important story to tell about a settlement. Wright also maintained that coins struck in Greece did not circulate outside of Greece. CPAC Member Robert O’Brien (public) asked Wright about Greek police enforcement activities. Wright indicated that Greek police are vigilant in such matters. Robert Korver (trade) asked Wright about the use of metal detectors. Wright indicated that he had no personal experience with them, but that it is evident that they are used to look for coins. Laetitia La Follette is an art history professor at the University of Massachusetts. She also spoke during the Italian MOU hearing. She indicated that looters steal from tombs and destroy what they do not want to sell. She also reiterated the Greek statistic that 61% of recovered artifacts are coins. She believes that museums should pursue long term loans. Jessica Nitske teaches at Georgetown University. She believe that long term loans are a better solution than purchasing antiquities that lack a provenance and might be fake. She believes the art market fosters the destruction of both artifacts and context. Elsie Friedland teaches classics at George Washington University. She reiterated her testimony from the Italian MOU hearing last May. She believes students are more interested in ancient art when they can also learn about its context. Senta German teaches at Montclair State. She supports the MOU and its extension to coins. She is concerned about the loss of context and the fact that the US is a major market for Greek antiquities. She believes that our nation’s founding fathers appreciation for Greek culture argues for supporting this MOU. Richard Leventhal teaches at the University of Pennsylvania and is a curator at the University of Pennsylvania Museum. Prof. Leventhal reiterated many of the same comments he made during the Italian MOU hearing. He is opposed to licit markets in antiquities. He does not believe in the concept of duplicates because each object is unique. Catherine Reid (CPAC Chair, museum) asked Leventhal about the effect of Penn’s adoption of 1970 provenance rules. Leventhal believes such rules provided the groundwork for the AAMD’s recent adoption of similar rules. He did concede that few new artifacts have come to the museum since the adoption of these rules. What has been accessioned has been only accessioned after a rigorous review process. Sebastian Heath is a VP for Ethics at the AIA. He is a strong supporter of the proposed MOU and its extension to coins. He discussed the recent seizure of two statues of youths in Greece. He also recounted the repatriation of a rare EID MAR denarius struck by Brutus, purportedly in Greece as a reason the MOU should be adopted. CPAC member Connelly (archaeology) asked Heath about bronze coins. He indicated these did not circulate. CPAC member Korver (trade) asked Heath about whether restrictions should apply to a Roman coin found in Greece. Heath answered in the affirmative. Heath believes that a common Roman coin found in context is equally valuable to a Brutus Denarius found in context. Arthur Houghton, identied as representing the Cultural Policy Research Institute, indicated that the MOU as proposed is devoid of specifics. He advocates sending back the request to define what is Greek and to coordinate this with other countries. Brian Rose is the AIA’s president and is a professor and curator at the University of Pennsylvania Museum. Rose indicated that the AIA has had a long relationship with Greece. He believes the MOU will help preserve context in Greece. He also supports an extension of import restrictions on coins. CPAC Chair Reid (museum) asked if Rose regretted the Penn Museum’s past collecting practices. Rose responded that virtually all the artifacts in the Penn Museum are the products of partage. Penn is working to digitize artifacts from digs it participated in along with those still left in source countries. CPAC member O’Brien (public) asked Rose if he would consider repatriating partage objects given the fact that it is often alleged that they are part of colonial practices. Rose responded that the Kingdom of Iraq gave Penn its first excavation permit after independence from the Ottomans. He further indicated that no country has asked for its partage artifacts back as yet, but the matter will be considered on a case by case basis if raised. Rose then agreed with trade representative Korver’s comment that what we know about coins is the product of a close collaboration between numismatists and archaeologists. When asked by Korver about why a schism between numismatists and archaeologist now exists, Rose disagreed that there is such a schism. Susan Alcock is an archaeologist associated with Brown University. Her major work has been in Greece and Armenia. Her specialty is the “systematic pedestrian survey,” that is “field walking” with an eye to trying to understand archaeology from an examination of surface finds. She indicated that the MOU would hopefully foster ecological tourism in Greece. Thomas Kline is an attorney and professor at George Washington University. [He has also served as legal counsel for the Republic of Cyprus]. He hopes more MOU’s are entered into as that will regularize trade to encompass “best practices.” He thinks if an MOU with Greece is entered long term loans will follow. Nancy Wilkie (archaeology) asked Kline about the benefits of MOU’s. Kline believes that they will force collectors and dealers to follow best practices. Patty Gerstenblith of DePaul University and the Lawyers Committee for Cultural Heritage Preservation focused her presentation on the concerted international response requirement. She indicated that a letter in the record from the Bavarian Economics Ministry is irrelevant because Bavaria is merely a transit point for artifacts, including coins. She also stated that the “first discovery” requirement is implicit in any designated list, in that an artifact must be found in a country for which restrictions are granted rather than produced there. She also indicated as more MOU’s are entered into, the first discovery issue will disappear. CPAC member Korver (trade) took issue with Prof. Gerstenblith’s contention that Germany is merely a transit point for coins. Korver also asked Gerstenblith about the “first discovery” requirement. She acknowledged that the place of modern discovery is the country of origin for purposes of the Convention on Cultural Property Implementation Act (“CPIA”). Under this scenario, the late Roman coin Sebastian Heath discussed found in Greece should have a country of origin of Greece. Larry Feinberg of the Santa Barbara Museum of Art spoke next on behalf of the AAMD. He expressed doubt about the breadth of the request and Greece’s ability to care for its own cultural property given its current economic crisis. He suggested the burden should be on Greece to show artifacts were found in Greece before Customs seizes them. CPAC member Connelly (archaeology) referred to an editorial by former AAMD President Maxwell Anderson in which he stated that museums should move beyond issues of ownership to stewardship. Feinberg indicated he did not disagree with Anderson, but that he thought long term loans were preferable to short term ones for financial reasons. CPAC Chair Reid (museum) asked Feinberg about a contention in the AAMD’s papers that Greece ignored requests for loans of objects. Feinberg indicated he would poll the membership. Reid indicated a similar poll was promised for Italy, but never received. Josh Knerly spoke next on behalf of the AAMD. He suggested that CPAC take a go slow approach on this MOU. The nature of the request needs much better definition. It is impossible for the public to comment intelligently on the request without it. He suggested that another hearing be held at a later date once more information is received. There is a great problem with identifying whether an artifact from the Greek world comes from Greece or not, which must be addressed. Mr. Knerly promised Chairman Reid that information would be provided with regard to loan requests made of Italy. Anthony Milavic, a Greek coin collector, spoke next. He described how an open market for ancient coins is necessary for his research into depictions of Greek sporting events on coins. He also described his personal effort to spread the knowledge he has obtained from such coins, including the preparation of articles and the making of presentations at a wide variety of venues. Dr. Scott Rottinghaus spoke on behalf of the American Numismatic Association and its 28,000 members. He indicated that the ANA is opposed to import restrictions on coins because they would negatively impact people to people contacts and the ANA’s educational mission. Further in this regard, he noted that import restrictions could have a devastating effect on foreign collectors and dealers attending the ANA’s conventions and that donations of coins to the ANA museum could also suffer over time. In response to a comment by CPAC member Wilkie (archaeology), that restrictions were only prospective, Dr. Rottinghaus indicated his agreement, but that over time restrictions would still impact the ANA ‘s and its members’ ability to procure coins. Wayne Sayles spoke next on behalf of the Ancient Coin Collectors Guild. Given the lateness of the hour, he departed from his prepared remarks to make a few points. First, he indicated that the ACCG supports the CPIA, but believes that its protections for collectors are not being applied. Second, he expressed surprise that Brian Rose did not understand that a schism has developed between archaeologists and numismatists. Mr. Sayles also acknowledged the opposition of the past president of the Hellenic Numismatic Society to import restrictions and complimented the representative of the Alpha Bank on the comprehensiveness of its own ancient coin collection. Rick Witschonke spoke next on his own behalf. Like he did at the Italian MOU hearing, he suggested that Greece adopt a program similar to the Treasure Act and Portable Antiquities Scheme in Britain and Wales. He noted that Greek law already had provisions that provided for rewards and the returns of insignificant items to finders, but that the Greek cultural bureaucracy had failed to apply them. He suggested that consideration of the MOU be tabled until such time that Greece complied with its own laws on this point. Michael McCullough, an attorney who practices customs law, spoke last. He first questioned whether the art market is contributing to looting in Greece. He then explained that US Customs has difficulty understanding that the country of origin of an antiquity under the CPIA is the modern find spot, not the country of manufacture. He also indicated that Customs typically will only allow import of artifacts pictured in auction catalogues or for which bills of sale are provided that show the artifact was out of its country of manufacture before the date of restrictions. He noted this is also contrary to the CPIA, which allows this information to be conveyed by certification. Under the governing law, CPAC is required to recommend whether to enter into a MOU with Greece, and, if so, what types of artifacts should be subject to import restrictions. At this juncture, Greece's request remains a proposal and not a "done deal" as some suggested in their comments. Why Not Let CPAC See this Coin? For over ten years, I've represented IAPN and PNG in hearings before CPAC. 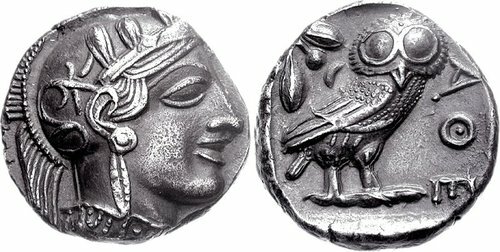 For all that time, I've used actual coins to illustrate the point that such artifacts circulated far beyond the borders of modern nation states claiming them to be "their cultural property." Just as long, members of the archaeological community have used their own "props" (typically pictures of sites they allege have been looted) in their presentations. No one has ever complained. Indeed, I recall at least one time when CPAC member Sandy Boyd commented positively about the coins during a session on Italy. Last Tuesday, I hoped to pass this attractive Athenian Tetradrachm from the Morcom Collection around along with another Greek coin and foreign copies. I thereby hoped to demonstrate that Greek coins were such important currency throughout the ancient world that they inspired local imitations. But, for some reason, it was not to be. Instead, I was told by CPAC Chair Reid that she could not accept the coins "on advice of counsel." Yet, for some reason, Professor Reid was not "advised by counsel" to reject pictures of looted tombs that were passed out by an archaeologist. What gives? Why not let CPAC see this and the other coins? Thank you for allowing IAPN and PNG- which represent the small businesses of the numismatic trade – the opportunity to speak to you again. Let me add my voice to the 70% or so of the public comments posted on the regulations.gov website that either opposed the MOU in full or opposed any extension of import restrictions to coins. This is a remarkable number, particularly when one also considers that the AIA and Greek Embassy actively lobbied archaeologists who excavate in Greece and others for support. 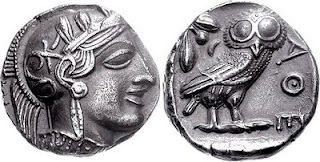 Numismatics, or the study of coins, used to be known as the “hobby of kings.” The large numbers of coin collectors opposed to restrictions confirms that this generally no longer the case, but in Greece it remains so. There, only a chosen few can hold ancient coins legally. But they can and do then import largely what they want. For example, the Alpha Bank and the Greek National Coin Collection accessioned rare, unprovenanced Athenian Decadrachms (worth $250,000 - $1 million) to their collections. Such coins are typically found outside of Greece. Thus, this is no “repatriation by purchase,” except in a nationalistic sense. Let me be clear. I am glad Greek museums and at least some Greek citizens can legally build large collections of unprovenanced ancient coins. But, then doesn’t that also make any Greek request for import restrictions hypocritical? Such import restrictions will only impact Americans. As a letter in the record from the Bavarian Minister of Economic Affairs demonstrates, many EU citizens trade unprovenanced Greek coins quite freely and without the need for export permits. This brings us to the CPIA’s “concerted international response” requirement. That provision, which seeks to ensure the comity and effectiveness of any import restrictions, cannot possibly be met here. Then, there is the “first discovery” requirement. Restrictions may only be lawfully imposed on artifacts “first discovered within” Greece. But, as set forth in our Greek Coin Finds study, coins struck in Greece and found elsewhere must account for some 18% of the estimated 350,000,000, or more ancient coins of the entire Greek world extant, making the “first discovery” requirement impossible to meet as well. CPAC should consider the potential impact of import restrictions on the ability of ordinary American citizens to collect Greek coins and to engage in cultural exchange with European collectors. Please, let’s not make coin collecting the “hobby of kings” once more. Hassan, a prominent preacher, currently presents a program on the Salafi-affiliated al-Rahma channel. The program, which is aired live, features inquiries via phone calls and he answers them on the spot. As for antiquities which are found on a public land, Hassan explained, a Muslim is prohibited from selling them, advising that he should re-bury them. The people who filed the complaint argue that this fatwa means that all antiquities discovered on private land are the possessions of the owner of that land, and that he has the right to sell and profit from them. This contradicts the law, which punishes any private circulation of antiquities. The preacher's view reflects the Koran's respect for private property, a theme that also runs through English law and the "takings clause" of the Fifth Amendment to the United States Constitution. It would be interesting to learn whether those who filed a complaint against the preacher are archaeologists or associated in some fashion with Egypt's cultural bureaucracy. I recently had the opportunity to visit the new Cambodian and Cypriot exhibits at the Smithsonian. Though the accompanying literature does not mention it, Cambodia and Cyprus presumably sent their exhibits to the Smithsonian as part of their MOU's with the United States. Both exhibits were well done, but I preferred the Cambodian exhibit over the Cypriot one because the quality of the artifacts. Perhaps, that is unfair. The focus of the Cypriot exhibit was on archaeology and history. The focus of the Cambodian exhibit was on art. The Cambodian exhibit highlighted some magnificent bronzes found near Angkor Wat, some of which have only been recently conserved. I was particularly impressed by this effort. Nothing seemed over cleaned. Many of the bronzes had beautiful patinas. The Cypriot exhibit was heavy on early pottery of more interest to the specialist, but there were also some magnificent icons. The coins from the Bank of Cyprus Cultural Foundation were also top notch specimens, but they were poorly lighted. And what of coins from excavations, particularly given all the archaeological emphasis on context? My favorite artifacts, though were the two sphinxes at the door. Though the Cambodian exhibit is superior, at least in my opinion, both exhibits are well worth visiting if you are in the Washington, DC area. In legal hearings, the proponent of a motion goes first. There are advantages to going first, but a key disadvantage is that your opponent can then respond to what you say. It's a bit odd then that the State Department's Cultural Heritage Center typically has the opponents of a MOU go first. As I recall, this pattern was only changed once when then CPAC Chair Jay Kislak indicated that despite the usual batting order, he wanted to hear from the proponents of the Italian MOU first. We'll see what happens next Tuesday during the Greek MOU hearing, but such oddities add to the perception that the staff of the State Department's Cultural Heritage Center favors archaeologists who are the proponents of MOUs. A U.S. soldier looted the AK-47 with Saddam Hussein's image from one of the late ruler's palaces in 2003. The pearl-gripped gun had been displayed as a war trophy at the headquarters of the Third Stryker Brigade of the Second Infantry Division in Washington State until the AK-47 was retrieved by U.S. Customs agents and returned to Iraqi authorities. Apparently, though our troops fought gallantly to overthrow the Iraqi tyrant, it was not possible for one of their units to keep this captured weapon as a war trophy. This seems wrong to me as does the description of the item being "looted." Perhaps, souvenir hunting is now officially frowned upon, but even under the politically correct standards of today, I wonder if it was a bit much for US Customs to seize this particular item from the Third Stryker Brigade, especially since it came from one of Saddam's palaces as opposed to a museum or private residence. All were lent by the private Bank of Cyprus Cultural Foundation. No provenance information was provided for the coins. None listed a recorded find spot. The Bank of Cyprus purchases coins on the open market from the same sources American collectors buy from. Yet, the AIA, the Cyprus American Archaeological Research Institute, the Bank of Cyprus Cultural Foundations and Cypriot cultural bureaucracy successfully agitated for extending import restrictions to coins, claiming that unprovenanced coins should be treated as "stolen." Members of the AIA and CAARI have also argued that artifacts without a known provenance lose their value for study. Is the MOU about protecting archaeology or giving the Bank of Cyprus Cultural Foundation and Cypriot collectors a competitive advantage over American collectors who can no longer legally import undocumented coins? Is there something wrong with this picture? Is this more of do what we say, not what we do? Why does the Obama State Department Bureau of Educational and Cultural Affairs countenance such discrimination against American collectors and the small businesses of the numismatic trade? And why are they also claiming that such discrimination is not subject to review by a court? The division of Cyprus is indeed tragic. It is also true that Turkish forces have damaged or destroyed Greek Orthodox religious sites over the years. Still, Greek Cypriots are not blameless in all this, and indeed, many experts point to their intransigence as a reason the Island remains divided. In any case, the Smithsonian presumably agreed to host the exhibit as a celebration of Cyprus' magnificent past rather than to provide a Cypriot politician with a platform on which to attack Turkey. Shame on the Cypriot Government for using our national museum for such purposes.